Add more kegs to your kegerator or keezer with a CO2 Distributor. 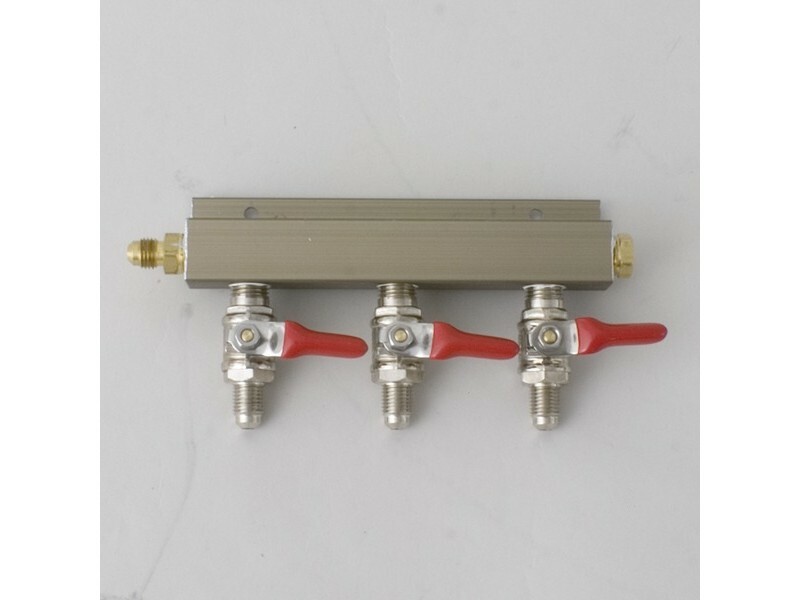 Or have an extra gas line available for your draft bottle filler.This CO2 manifold comes with three 1/4" MFL shutoff valves and a threaded MFL inlet for flexible installations where the lines can be removed. 1/4" MFL connections work with barbed swivel nuts, so a variety of tubing sizes can be used.Corrosion-resistant nickel-plated brass manifold has shut-off valves with an integral check valve to prevent backflow of gas or liquid.We highly recommend a flared nylon washer in each swivel-nut connection to prevent leaks.For a more permanent installation, check out our distributors that have barbed connections.Looking for a complete system? See ourDraft Brewerkeg systems.